Thank you to Wendy Shuttleworth for the following information. 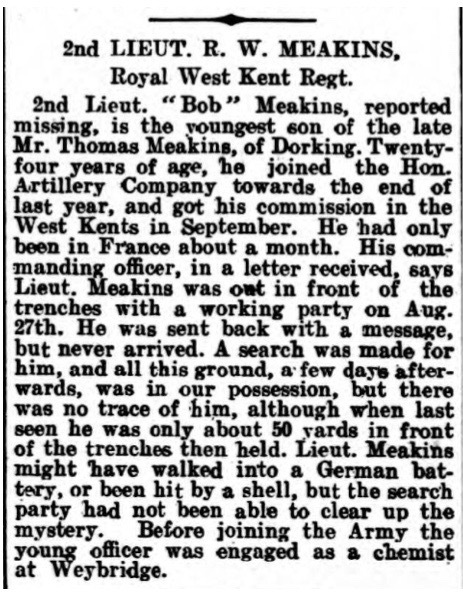 Robert Meakins was born in Dorking in 1892 to parents Thomas and Elizabeth. Robert’s father was the local Coal Merchant. By 1901 Robert’s mother had died and he was living with his father, brothers and sisters at 60 High Street Dorking. In 1911 Robert had moved away and was living at 8 Queens Road Evesham and was an Assistant Chemist, by 1914 and 1915 he was in Church Street, Chertsey. When he enlisted he was a private and then promoted to 2nd Lieutenant. 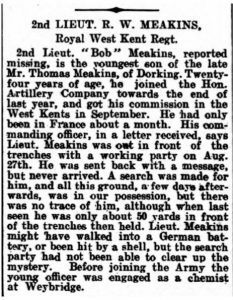 Was sent to France on the 1st August 1916 and died twenty six days later.